This spring and summer, many people will fire up the patio or backyard grill after work or on the weekends. While there is nothing like grilling up a burger or steak on your own grill, one Massachusetts fire marshal wants to remind everyone to follow all recommended safety practices, and do whatever you can reasonably due to prevent fires and burn injuries. According to a recent public safety announcement from Wicked Local East Bridgewater, the town fire marshal recommends everyone take the time to inspect their propane and natural gas grills for any leaks and cracks prior to using them, as this can help prevent serious personal injury. He also urges parents to teach their young children to stay at least three feet away from a lit grill at all times, as children are at a particular risk for accidental burn injuries. As our Boston burn injury attorneys can explain, you should also make sure all connections on gas lines are secure and tight prior to igniting the grill for the first time this season and every time you replace a propane tank. One helpful hint is to prepare a solution of water and liquid soap in equal parts, and place the solution in a household spay bottle. 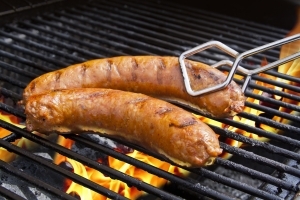 Once the gas line is turned on, but before the grill is ignited, spray the lines and tank with the soapy mixture. If there are any bubbles forming after spraying the lines, this means there is a leak present, which must be repaired. If the leak occurs in a rubber gas line, you should shut off the gas and go to a local hardware store to purchase a replacement gas line. Once the new line is installed, you should use the soapy solution again to help make sure there are no additional leaks. Another helpful hint is to never grill inside, and always make sure the grill is placed in a location away from all buildings and structures, including railings. It is illegal to use a grill on a fire escape or indoors. It is also a violation of state law to use a gas or charcoal grill on a patio or deck, unless the deck has a separate stairway to the ground or is build at ground level. You should also check for any trees or overhanging structures, as a grill can flare up and start a serious fire. It should be noted, electric grills, which do not have any open flame, may be used on patios or decks in most locations, but it is still important to use all appropriate safety precautions to prevent fires and burn injuries. Just to get an idea of how common these accidents are, the Commonwealth of Massachusetts Fire Incident Reporting System (MIRS) received 103 calls for fires last year caused by cooking grills, and emergency rooms saw many more patients for serious burn injuries. Many of these injuries were suffered by guests to the home where fires occurred, and these victims suffered serous personal injury, permanent scarring, and accrued significant medical bills.